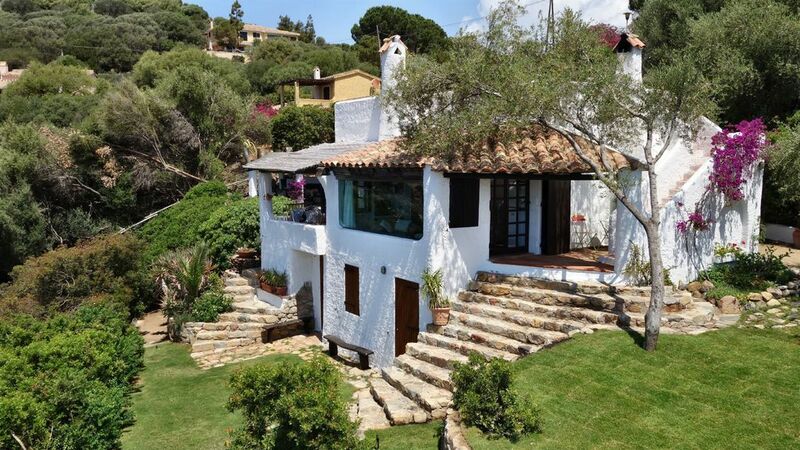 (Text automatically translated) The villa, placed in a large Mediterranean garden is located on the headland between the two beaches of Torre delle Stelle, about 30 km from Cagliari. It enjoys a magnificent view of Cala Delfino. The location ensures privacy and tranquility. The covered area of ? ?the house is 130 square meters on a property of 1500 square meters, the distance from the bay it overlooks is 100 mt. Delightful property in central location. 10 minutes walk to the beach. Peaceful and quiet. Would definitely recommend the property. The owners are very helpful and polite. However you do need a car to get around. Grazie Ilona! Siete stati degli ospiti esemplari! Buon tutto...!!! "The house was clean and all in order. The place is amazingly silent, both in the night and day. The view from the villa is fantastic - flank of hill, all green, and then rocks and the sea below. "Great and peaceful place where to relax and spend holiday. The view from the veranda and roofterrace is really beautiful. The veranda (balcony) is excellent place for dining or only sitting. The property is functional. Grazie Gianni e Luciana!" Una casa che sa di Sardegna in ogni dettaglio, con una vista sul mare di Cala Delfino senza pari ... ed i delfini si possono avvistare davvero!! Abbiamo trascorso una splendida settimana a Villa Paluma e speriamo di poterci tornare al più' presto. Grazie Marco, sarà un piacere avervi ancora come ospiti! We had a wonderful time at the house. The view is amazing, we even saw a whale. Bbq area is great as well as the indoor kitchen. It’s a 10 min walk down to the stone beach and a 15 min walk / 5 min drive to the sand beach. There‘s no WiFi, which is claimed in the description. As we had planned to also work there and needed WiFi for that, this was a downside for us. Hatten wunderschöne zwei Wochen in der Villa Paluma. Durch die sehr ruhige Lage hört man nur das Rauschen des Meeres. Die überdachte Terrasse mit dem Grill ist sehr gemütlich und wir verbrachten schöne Abende mit sehr gutem Essen. Das Haus ist sehr liebevoll eingerichtet und mit allem ausgestattet das man benötigt. Wir würden dieses Haus wieder buchen. è stato piacevole avervi come ospiti e vi ringraziamo anche per le belle parole che avete scritto sul nostro " GUEST BOOK" !!! Tariffe in funzione del numero di persone, Consegna delle chiavi da parte del Proprietario non presente in loco.